The elder Darrell Rogers lent him a hand, just to be sure. It’s a remarkable turnaround for the 16-year-old Matawan High School basketball standout. In May, during a club-team practice, Rogers suffered sudden cardiac arrest. He collapsed and stopped breathing, was revived by two coaches and helicoptered to Robert Wood Johnson University Hospital, where the prognosis was grim. Darrell Jr. beat the odds. He’s scheduled to go home Wednesday, and a community will be waiting. They’ve pitched in from all angles — food, money, moral support. A big fundraiser featuring WFAN talk-radio host and former New York Jets quarterback Boomer Esiaison takes place Tuesday in Aberdeen, with another event on tap for Aug. 25. Darrell is a point guard. In the parlance of the position, there have been many assists during his recovery. But it’s a winding road. For now, there are small victories. 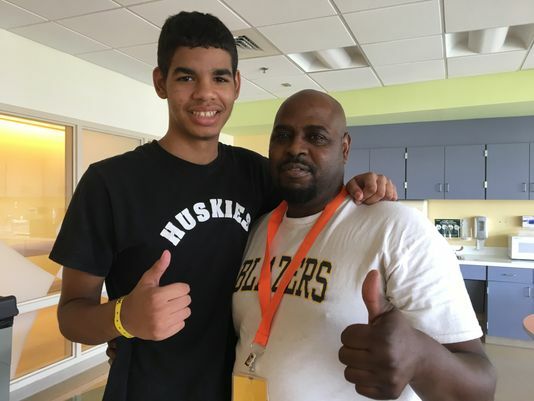 “I’m doing better,” Darrell said, wearing a black “Huskies” T-shirt from his high school. Like a long-range jumper that hit the rim and bounced in, this easily could have gone the other way. Rogers turned in a fine sophomore campaign at Matawan. The 6-foot-2 floor general was the third-leading scorer as the Huskies went 20-6. In the spring he traveled extensively on the AAU circuit with the Blazers. Bucknell and Georgia State were among the Division I programs giving him a look. On May 21, Rogers collapsed as he went up for a layup during AAU practice at Matawan-Aberdeen Middle School. He was unresponsive until two coaches, Sean Sheppard and Chris Schuster, revived him through CPR. Rogers did have a diagnosed heart murmur, but his father said he’d been cleared to play. After the collapse, doctors determined the cause to be hypertrophic cardiomyopathy, a common trigger of sudden cardiac arrest in young athletes. It’s the same condition that killed Boston Celtics star Reggie Lewis at age 27 in 1993 and Loyola-Marymount All-American Hank Gathers at age 23 in 1990. Rogers’ parents have joined the growing chorus calling for all high school and college athletes to receive an electrocardiogram (EKG) in standard preseason physicals. Thanks to nonprofits like Nicole’s Heart Foundation — established after St. John Vianney pole vaulter Nicole Trott died of sudden cardiac arrest in 2011 — free cardiac screenings for teens take place a few times a year in the area​​​​​​. The next one, by Alpert Zales and Castro Pediatric Cardiology is Oct. 13 at Old Bridge High School. Darrell's life hung in the balance for four days until he moved off a ventilator. It’s uncertain when Rogers will return to school. He may be home-schooled for a while as he undergoes outpatient therapy. Doctors implanted a defibrillator in Rogers’ heart and, according to his dad, haven’t ruled out a return to sports. Baylor guard King McClure has the same condition as Rogers, and he plays college basketball with a defibrillator implant. Last season, the junior guard averaged 8.3 points for the Bears. The miracles of modern medicine come at a price, of course. Even with health insurance, Rogers’ family will owe an enormous amount, likely well into six figures. “We don’t know right now how much insurance is going to cover,” said the elder Rogers, who has taken leave from his job as a custodian to be by Darrell’s side full-time. People have been incredibly generous. A GoFundMe plea raised $20,000 in the month after Darrell’s collapse. Fellow AAU parents cooked meals for the Rogers family for weeks. Friends and neighbors gave Darrell’s mom and dad gas money so they could commute to Robert Wood Johnson and the Children’s Hospital of Philadelphia. On Tuesday, Esiason and a team of WFAN personalities, including Hazlet resident Jerry Recco and Al Hughes Dukes, will play a charity softball game against members of the Matawan and Aberdeen police departments. Tickets are $10. The game takes place at 6 p.m. at Oakshades Field in Aberdeen. On Aug. 25, Matawan High boys and girls hoops players will play a co-ed charity game at Matawan-Aberdeen Middle School. Doors open at noon and tip time is 1 p.m. When asked for a message to folks back home, Darrell Jr. nodded his head and said, “Thank you, everybody." A point guard knows a great assist when he sees one. Tickets to the Aug. 21 softball game can be purchased at Matawan Police Department's headquarters Monday-Friday, 8 a.m to 4 p.m. For more information Contact Sgt. Chris Stark at 732-290-2020, ext. 2923. For more information on the co-ed basketball game Aug. 25, email ladyhuskyball@gmail.com. For a thank-you message from Darrell Rogers Sr., check out the video atop this story.